Often quoted, rarely understood. 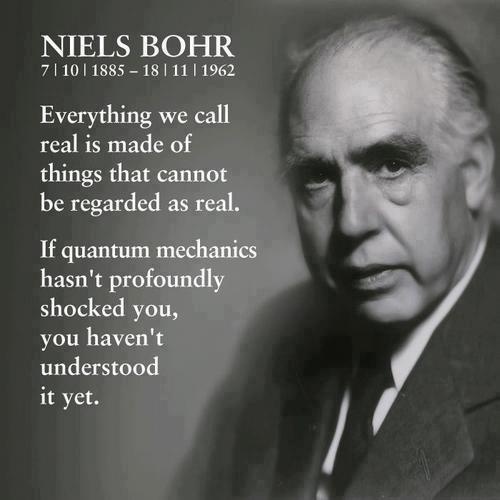 Niels Henrik David Bohr. Love the guy. How great is this quote? Seriously. Just let it marinate. We are all agreed that your theory is crazy. The question that divides us is whether it is crazy enough to have a chance of being correct. My own feeling is that it is not crazy enough. – Said to Wolfgang Pauli after his presentation of Heisenberg‘s and Pauli’s nonlinear field theory of elementary particles, at Columbia University (1958), as reported by F.J. Dyson in his paper “Innovation in Physics” (Scientific American, 199, No. 3, September 1958, pp. 74-82 – reprinted in “JingShin Theoretical Physics Symposium in Honor of Professor Ta-You Wu,” edited by Jong-Ping Hsu & Leonardo Hsu, Singapore ; River Edge, NJ : World Scientific, 1998, pp. 73-90, here: p. 84). And this beaut. Shout out to Max. — Max Planck, Scientific Autobiography and Other Papers, trans. F. Gaynor (1950), 97. Quoted in David L. Hull, Science as a Process (1990), 379.